828-694-3600 FINANCING AVAILABLE FOR ALL CREDIT TYPES!! Though more civilized than ever, the 2014 Jeep Wrangler is still a no-nonsense American icon. Its unique character and off-road abilities continue to appeal. The 2014 Jeep Wrangler is unchanged, though there are minor changes to various option packages. Superior off-road capability; two- and four-door variations; extensive aftermarket parts availability; surprisingly fun to drive around town. The 2014 Jeep Wrangler is a no-nonsense vehicle that's at its best when the pavement ends. This classic SUV will climb over rocks, cross streams and frolic in the sand dunes whenever you please, thanks to its standard four-wheel drive and high ground clearance. Just don't expect too many comforts along the way. Although the current Jeep Wrangler is the most civilized version ever, it's still noisy, rough-riding and nothing at all like the compact and midsize crossover SUVs that dominate this price range. However, if your weekend plans include off-roading, this Jeep is arguably the most capable utility vehicle you can buy. It's also among the most versatile. Not only can you choose a Wrangler with two or four doors, you can remove the roof, doors and even the windshield if the mood strikes (and you have the right tools). Although, in practice, you probably won't care to drive the Wrangler for sustained periods of time without these components. We'd recommend the soft top over the (heavy) hardtop if you plan to drive your Wrangle al fresco on a regular basis, but keep in mind that it makes your Jeep more vulnerable to thieves and still requires considerable time and patience to remove and reinstall. Whether you see this as one of the Wrangler's quaint charms or an unnecessary hassle largely depends on your expectations. Of course, some of the Wrangler's issues can't be brushed off as easily. Braking distances are long, and handling on paved roads is far less steady and refined than other SUVs you might be considering. Still, there's unexpected fun to be had in driving a Jeep Wrangler around town, as its short wheelbase makes it blissfully easy to maneuver in tight spaces if you don't mind the slow steering. The V6 engine provides sufficient power, too, and if you don't find what you're looking for on the factory options list, the Wrangler enjoys massive aftermarket parts availability from both Chrysler's in-house supplier Mopar and hundreds of independent companies. If the Jeep Wrangler's rugged image and off-road capabilities appeal to you, we'd recommend a lengthy test-drive. It's not uncommon for shoppers to be drawn in by the Wrangler's cool factor only to realize soon after they've purchased one that a compact crossover or a more livable off-roader like the Nissan Xterra or Toyota FJ Cruiser would have been a better choice for driving to work every day. If you know what you're getting into, though, the 2014 Jeep Wrangler is a wonderful way to get back to basics and back to nature. with subtrims including the Altitude, Polar, Freedom Edition, Willys Wheeler and the Rubicon X. The Sport comes sparsely equipped with 16-inch steel wheels, front and rear tow hooks, foglamps, a removable black soft top, crank windows, manual locks and mirrors, cruise control, a tilt-only steering wheel, a height-adjustable driver seat and a six-speaker sound system with an auxiliary audio jack, CD player and steering wheel controls. The Unlimited Sport gets four doors, a bigger gas tank, more backseat and trunk space, air-conditioning and a 60/40-split-folding rear seat. The Power Convenience Group adds heated power mirrors, an auto-dimming rearview mirror, power locks and windows and keyless entry. Air-conditioning (for the two-door), satellite radio, a leather-wrapped steering wheel and 17-inch alloy wheels are also optional. The Sahara adds the above options plus 18-inch alloy wheels, an upgraded suspension, under-hood insulation, side steps, automatic headlamps, body-colored fender flares, power windows and a six-speaker Alpine sound system. The Rubicon is not the most abundantly equipped trim level; instead it boasts the most robust off-road credentials. On top of the base Sport equipment, the Rubicon adds special 17-inch wheels, 32-inch tires, heavy-duty axles and transfer case, electronic front and rear locking differentials, a disconnecting front sway bar, rock rails, air-conditioning, a leather-wrapped steering wheel and satellite radio. The previously mentioned Power Convenience Group (heated power mirrors, an auto-dimming rearview mirror, power locks and windows and keyless entry) is an optional extra on the two-door Rubicon, but it's standard on the Rubicon Unlimited. The Connectivity Group is available across all trims and adds Bluetooth, a USB/iPod interface, an upgraded trip computer and a tire pressure monitoring display, as well as a leather-wrapped wheel and shift knob on the Sport and Sport Unlimited. Also optional on all trims is a multi-piece removable hardtop with a rear defroster and wiper; you can buy it in addition to, or instead of, the standard soft top. The default color on the hardtop is black, but you can also get it in body color on the Sahara and Rubicon. Jeep also offers a premium version of the soft top made of nicer material; it's available on all trims. Optional on the Sport and Sahara is a limited-slip rear differential, while the Sport and Rubicon can be equipped with half doors that include plastic side windows. 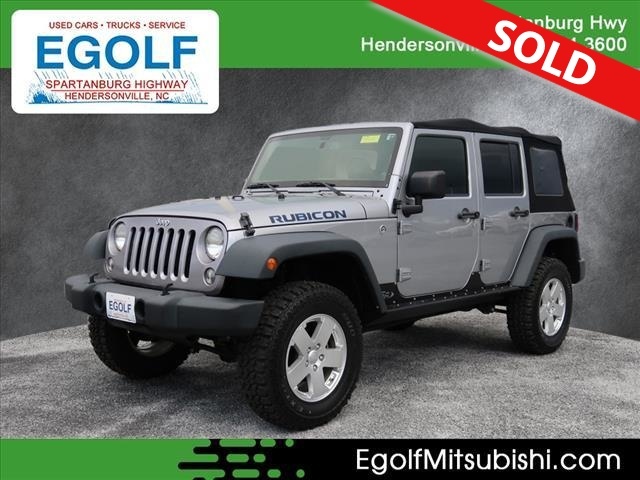 The Sahara and Rubicon can be equipped with leather upholstery and heated front seats, automatic climate control and a navigation system that includes a touchscreen interface, digital music storage and real-time traffic. The 2014 Jeep Wrangler comes standard with a 3.6-liter V6 that produces 285 horsepower and 260 pound-feet of torque. Four-wheel drive is also standard and includes high- and low-range transfer case gears, though the Rubicon features an upgraded transfer case with extra-low gearing. A six-speed manual transmission with hill-start assist is standard, while a five-speed automatic with both hill-start assist and hill-descent control is optional. When properly equipped, the Wrangler Unlimited has a maximum towing capacity of 3,500 pounds, while the two-door Wrangler tops out at 2,000 pounds. In Edmunds performance testing, a manual-equipped two-door Wrangler went from zero to 60 mph in a surprisingly quick 7.1 seconds. A heavier Wrangler Unlimited with the automatic transmission did it in 8.8 seconds, which is about a second slower than an equivalent Nissan Xterra. EPA-estimated fuel economy for the two-door is 18 mpg combined (17 mpg city/21 mpg highway) regardless of transmission. The Unlimited is rated 18 mpg combined (16 mpg city/20 mpg highway) with the automatic and 18 mpg combined (16 mpg city/21 mpg highway) with the manual. The 2014 Jeep Wrangler comes standard with antilock disc brakes, traction and stability control, front airbags and hill start assist. Front side airbags are optional. In Edmunds brake testing, both two- and four-door Wranglers came to a stop from 60 mph in about 140 feet. It should be noted that the Wrangler's doors do not provide the same level of protection as regular doors do in a side crash. As such, it won't surprise you that the Wrangler doesn't fare well in the Insurance Institute for Highway Safety's side-impact crash test. Without side airbags, the two-door Wrangler earned the worst rating of "Poor," while the Unlimited got the second-worst "Marginal." However, both the two-door and four-door Wranglers get the best possible rating of "Good" in the IIHS's moderate-overlap frontal-offset test. The two-door Wrangler earned a Marginal rating in the Institute's newer, small-overlap frontal-offset test (which concentrates crash forces on a smaller section of the front bumper), but in fairness, most compact SUVs have done poorly in this test. Though Jeep has refined and civilized the Wrangler over the years, there's no hiding the fact that the Wrangler's interior prioritizes function over comfort. Lean and durable, the cabin can be cleaned easily after a day spent in the dirt and dust. Despite the abundance of hard plastic surfaces, it's fairly attractive, with rounded lines that give it a fluid, organic look. With the two-door, you'll find a backseat that seats just two passengers. Leg- and foot room in back are also pretty limited. If that isn't sufficient, the Unlimited offers room for three and its extra set of doors provides easier access. There's not much cargo room behind the two-door Wrangler's backseat (just 12.8 cubic feet), but the four-door Unlimited offers a more useful 31.5 cubic feet. The four-door also offers a respectable 70.6 cubic feet of cargo space with the rear seat folded, compared to only 55.8 in the two-door. Raising and lowering the soft top on any Jeep Wrangler takes time and patience. Storing cargo within a soft top is also risky, since the top is easily compromised by thieves, and only the meager glovebox and center console can be locked. The optional hardtop, which features removable T-top-style panels over the front seats, is a smart solution for those who don't intend to go completely al fresco on a routine basis. Bear in mind, though, that the hardtop is heavy, so you'll need a friend to help whenever you want to remove it. If your mission is to blaze trails off-road, you won't do much better than the 2014 Jeep Wrangler. The Rubicon trim is especially capable, thanks to its specialized hardware. The Wrangler Unlimited four-door isn't as nimble on tight trails as the shorter two-door model, but more generous cabin space means you can carry additional gear. The four-door also feels more stable around corners and on the highway. Nonetheless, all Wranglers suffer from tippy handling, a rough ride and slow steering that is kindly described as nebulous in feel. Road and wind noise are also excessive. While the Wrangler won't win any drag races, its V6 is capable and gets the heavy SUV moving briskly. The standard six-speed manual features precise but long throws, an easily modulated clutch and a hill start assist feature, which is a godsend for stopping and starting midway up hills while going off-road. The five-speed automatic, meanwhile, offers smooth shifts and good fuel economy. Acceleration can be sluggish in the heavier Wrangler Unlimited models, and when you factor in the automatic transmission's slow gearchanges, passing maneuvers often require a bit more planning.